A parliamentary report of 1777 recorded a parish workhous in operation at Ross able to accommodate up to 100 inmates. County of Hereford: Ballingham, Brampton Abbots, Bridstow, Brockhampton, Foy, Goodrich, Harewood, Hentland, Hope Mansell, How Caple, King's Caple, Lea (part of), Llandinabo, Llangaran (2), Llanwarne, Marstow, Pencoyd, Peterston, Ross (4), Sellack, Sollers Hope, Tretire with Michaelchurch, Walford (2), Weston under Penyard, St Weonards, Upton Bishop, Yatton. County of Gloucester: Lea (part of), Lea Bailey Hamlet. The population falling within the union at the 1831 census had been 11,973 with parishes ranging in size from Llandinabo (population 53) to Ross itself (3,078). The average annual poor-rate expenditure for the period 1834-36 had been £6,054 or 9s.6d. per head of the population. A new union workhouse was built in 1836-7 adjacent to the site of the existing parish workhouse on Alton Street at the south of Ross. It was designed by John Plowman. By the late 1860s, the premises were proving unsatisfactory and the workhouse was rebuilt. The new buildings were designed by Messrs Hadden Brohers of Hereford. The entrance on Alton Street was flanked by an infirmary and fever wards at the east, and administrative offices and receiving wards at the west. The infirmary was of two storeys with a central section containing nurses's rooms and stairs, with a wing for males to the west and females to the east. A separate fever block stood to the east of the infirmary. The administrative block contained the Guardians' board room, clerk's office and waiting room for relief applicants. Ross administration block from the south, 2001. The main block was based on a corridor plan which was the most popular design at that time. It was of three storeys, with the master's quarters at the centre, men's and boys accommodation at the north, and women's and girls at the south. To the west of the main block stood the workhouse's dining hall, kitchens and laundry. A casual ward lay at the north, and contained both sleeping cells and labour cells where stone-breaking was performed. A children's playground and single-storey school-room also stood to the west of the main block. The workhouse location and layout are shown on the 1903 map below. 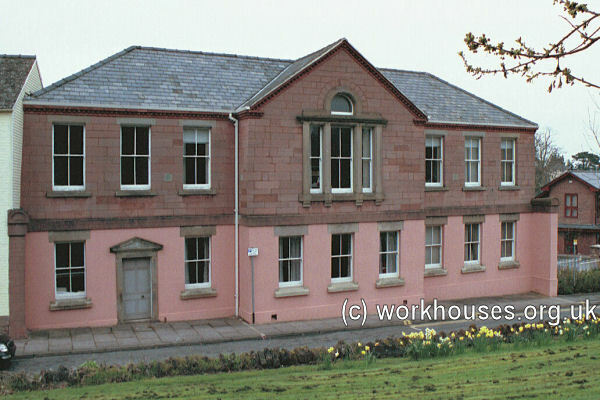 The workhouse later became Ross Poor Law Institution and more recently Dean Hill Hospital. Almost all the buildings were demolished and rebuilt as Ross Community Hospital in 1997. Herefordshire Archives and Record Centre, Fir Tree Lane, Hereford HR2 6LA. Very few records survive — Relief order books (1915-24); etc.